Well-known around the globe for manufacturing and exporting a wide range of Fly Ash Bricks & Fully Automatic Block Making Plant, "Bhagavati Hydraulic ", started its operation in the year 1996. The product range offered by us is inclusive of Fly Ash Bricks Making Plant, Fully Automatic Block Making Plant and Hydraulic Paver Block Making Machine. Precisely engineered in adherence to the international quality norms, these hydraulic press and paver block machines are easy to operate and require minimum maintenance. In addition, these industrial machines are known for their energy efficiency, durability, high performance and robust design. 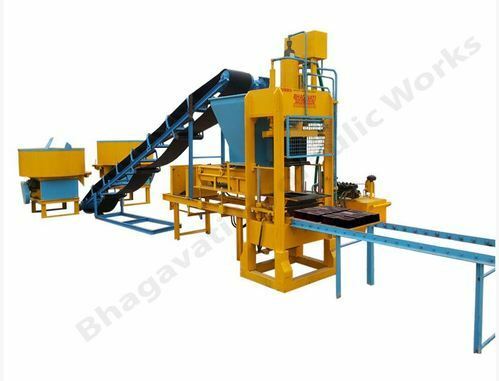 Owing to this, the offered range of Fly Ash Bricks & Fully Automatic Block Making Plant are widely demanded in the market. Offered by us, these industrial machines are manufactured by using advanced machinery from quality assured materials. In compliance with the specification provided by the patrons, the offered range of industrial machines can be custom made. The team in the most dedicated and united manner, help us the greater result.